To be used individually, Multiplex full-size, freestanding display panels require locking display feet. Each pair includes adjustable nylon guides to assure a perfect fit. 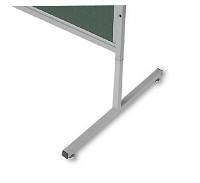 In light gray to match display panels' baked enamel, steel tube frames.